Pear: เย็นนี้กินอะไรดี yen-níi gin à-rai dii? What shall we eat this evening? Pear: อาหารญี่ปุ่่นดีมั้ย aa-hăan yîi-bpùn dii mái? No, I like Japanese food more. But I like Italian food more. But Italian food is more expensive than Japanese food. Japanese food is alright then. ไปกินที่ไหนดีอ่ะ bpai gin tîi-năi dii à? Where shall we go tot eat? Pear: Gateway ดีมะ Gateway dii má? Soi Sukhumvit 39 is more delicious. But Ekkamai Gateway is closer. Mod: เอกมัยเกตเวย์ก็ได้ ไปยังไงดีอ่ะEkkamai Gateway gâw-dâai , bpai yang-ngai dii à? Ekkamai Gateway is alright then. How should we go? But going by sky train is faster. Great job Mod&Pear! The role play/conversation is extremely useful along with your explanations and the scrip of the conversation. Just what a student of Thai needs! Thank you for all your work! Hello mod. I enjoy your lessons very much. I would like to wak why Paer uses the word “ชั้น” for the female “I” rather than “ฉัน” how I usually see it written. Thank you for teaching me the most beautiful language in the world. Hello Mod. Thanks for your advise to watch thai movies with eng subtitle. Thai clause and Thai Phrase. So thanks to you. Whenever I got the free time I watch your role play. Day by day, I can speak Thai Language to some extend. hi Kroo mod. I’m a Finnish man and I have been following your training videos. I have one problem. Finnish and English grammar is so diffrent, for me, will be difficult to learn the Thai language. because I have to think about it first in English and then in Finnish. . do you have any idea how I could better learn the Thai language. you are really a good teacher, I like your videos. all the best to you both mood and pearl. You are getting more and more professional in constructing your video. 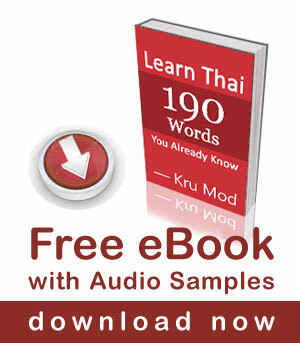 This way, learning Thai with you is so enjoyable. phom choop videos khun maak.